For sensational wedding and event decor, we work hard to get only the best so that you get only the best and our line of decorative flowering trees are luscious from top to bottom! It's sure hard to beat the beauty of a cherry blossom tree in full bloom so why not enjoy this elegant flowering tree year round! 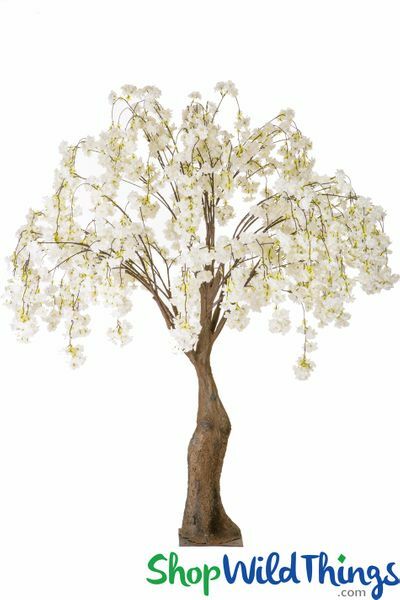 Our Cream Flowering Cherry Blossom Tree is 6' tall and so realistic looking that you'll be doing a double-take! 6 Feet of pure delight and one of the best features is that all the branches (and there's a lot) are bendable so you can spread this out to 5' wide or compact it to around 4' wide! 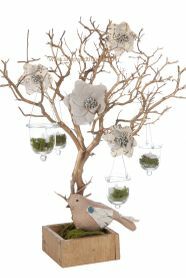 Now, that fills quite a large area and the end of each branch dangles down, creating a cascade of dreamy creamy blooms. it's absolutely breathtaking! At the very base, the trunk is 16" in diameter, around 8" in the mid-section and 6" towards the top. The trunk is fairly straight and looks incredibly realistic. There are 10 main branches that are identical so assembling this tree literally takes under 5 minutes. Easy up, easy down, easy transporting and storing! Each main branch consists of 9 smaller branches that are very durable and completely bendable! Shape it how you'd like and it WILL keep its shape. The base of the 10 main branches is a square metal housing which simply slides into the square holes on the trunk and the look is completely seamless. The branches meld perfectly into the trunk. Very quick and easy! In the center of the base of the top 4 branches there is an area about 1 1/2" in diameter that could easily hold a small bottle of scented oil (like cherry blossom!) or a battery operated DazzLED light! Worried about stability? Well don't. This tree weighs 21.7 lbs. and at the bottom is an 11 3/4" square metal plate. The tree trunk is attached to the base - they are 1 unit that will not come apart. Additionally, the metal base has 4 holes (each 3/4" in diameter) so you can 'permanently' install this tree. It's hard to believe but there are so many branches and blossoms that you could actually remove several of the main stems and use them in a vase and you won't notice them missing from the tree. Seriously, that's just how full it is! Add fairy string lights...OOH! 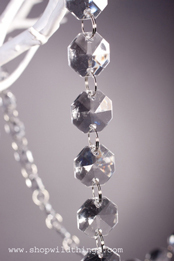 Hang crystal garlands or crystal pendants and ornaments...AHH! You could even expound on the realistic qualities of this tree by placing in a planter box! Around the house this is perfect for a covered patio, sunroom or foyer. For restaurants, stores and hotels, welcome your guests with eye-popping blossoms and celebrate the holidays by decorating with colored LED string lights! If you're planning a large venue, place on a table and make this the grand showpiece of the room! 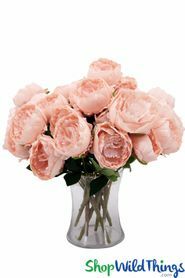 You will be amazed by this elegant blooming beauty and when only the best will do for your event, choose the best with this easy up, pleasing to the eye, exquisite accent piece!